I don’t know if madness really runs in families. It seems like an old-fashioned idea—borne more from an urge to predict a person’s future than to discover the truth about an illness. It could also be a terrible way to slander someone. In Helen of Four Gates, it is exactly that. Of course, this slander would have no power if the principles involved didn’t believe—every one of them—in the idea of hereditary madness. This belief allows a young English maid to instantly drop the man she was about to marry, simply because another man, named Hinson, informs her that her fiancé has batty relatives hanging in his family tree. It doesn’t occur to her that Hinson might be taking advantage. And we’ll never know for sure if he was. Because soon, he’s dead. 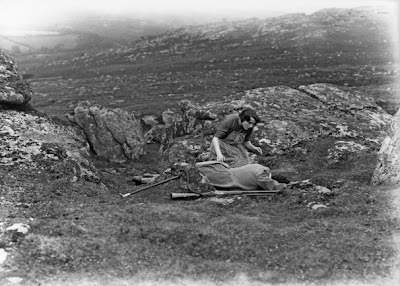 And then the fickle maid, who married Hinson and bore him a daughter, lies dying herself. And to whom does she give custody of her still-infant child, Helen? Why, Abel Mason, the man she dumped. Maybe she was the crazy one. Helen of Four Gates is a strange film in many ways. 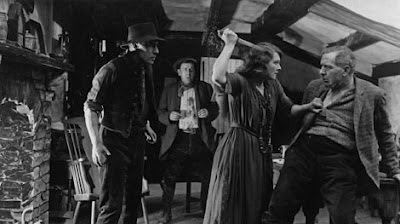 I’m told it’s typical of British director Cecil M. Hepworth’s style, but having seen no other Hepworth film, I can’t be sure. It’s certainly flawed. Scenes linger because Hepworth refuses to cut them. The performances are rudimentary and a bit over the top, with any emotional complexity the movie has being provided by continuous plot developments, to which we and the actors seem to react more or less the same way, at the same time. 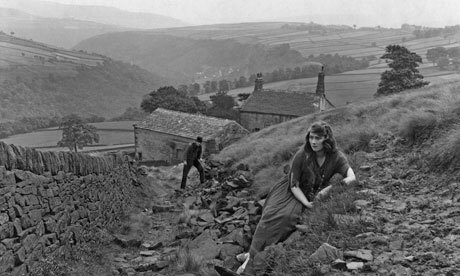 But Hepworth’s choice of landscapes is noteworthy (more on that later), as is the film’s treatment of insanity. It is not madness itself, but the presumption of what makes people mad, that drives Helen’s characters and ultimately, our fascination with them. Abel (James Carew) actually is mad, or at least profoundly embittered. An intertitle makes it clear that he accepted Helen only so that he might visit his revenge upon her mother, through her. This is pathetic. But it does show, once more, the implied power of familial bonds. If we can pass insanity down to our children, can’t we also pass guilt? There’s some theological precedent for that, at least. 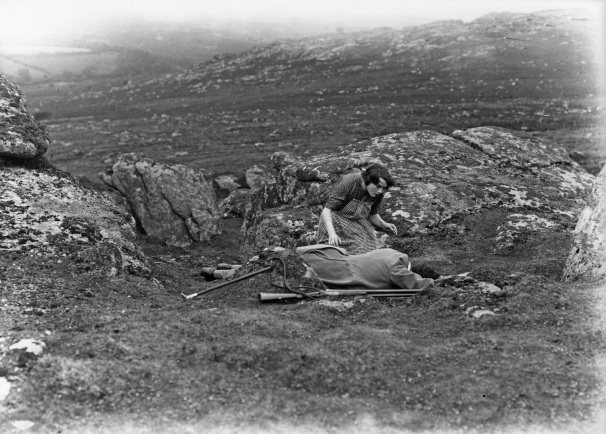 Helen is raised alone, on Abel’s substantial farm, as Abel’s child. Presuming herself to be Abel’s offspring, Helen must also presume herself doomed to insanity some time later in life. And, as played by British film star Alma Taylor, she does seem a bit off. But so does everything else. There’s a misty weirdness about things and people in Helen of Four Gates. It’s set on the moors after all, and the moors get to you. There’s precedent for that too. Helen meets a boy—a farm-hand—named Martin (George Dewhurst); falls in love with him like a young girl would, then gets paranoid about keeping him. She draws a circle in the grass, stands within it, and chants about shared graves. “Mine, mine, mine,” she says. Steam rises from the circle. Martin proves strange himself. He grows weak and finally delirious from overwhelming regrets. In this state he’s as raving as Abel, but no one blames Martin’s genetics. No, Martin’s degraded condition is a product of colossal stress. As is Helen’s quasi-satanic spell circle, I think. Maybe that’s true of a lot of troubled people. Helen of Four Gates gives you time to ponder ideas like this; not so much during the overlong scenes on the farm, but during the splendid moments the stars spend out of doors—backgrounded by miles and miles of rolling terrain. These are not just beauty shots. They deliver a message too. 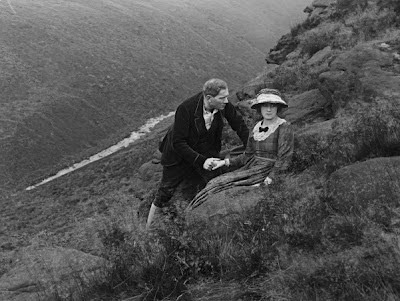 Hepworth often films his characters, especially Helen, sitting or standing on angles: grassy hillsides, for example, or in one case, a stream flowing downward. Behind them, perhaps far in the distance, are other diagonals—other hillsides, for example—angled in the opposite direction. I’m reminded of a point someone made to me once about banks: how they’re traditionally built using only straight lines, because horizontals and verticals imply stability, immutability. Hepworth’s natural settings have none of that. They seem to swallow his characters; we never see them anywhere else. Is it a maddening ‘place’ then, that these characters occupy? One imposing madness upon them from all sides? A ‘place,’ both literal and figurative? Helen’s in a bad place right now, I know that much. What you make of that is your business. I saw Helen of Four Gates live at Cinefest 32, in Syracuse, NY; Thursday, March 15, 2012. Accompaniment was provided by Dr. Philip Carli.